If you've previously sent an email campaign with a layout you love, you can use it as the starting point for new email campaigns. After you save a campaign as a template, you'll also have the option to share your layouts across accounts. In this article, you'll learn a few different ways to reuse an email campaign layout. 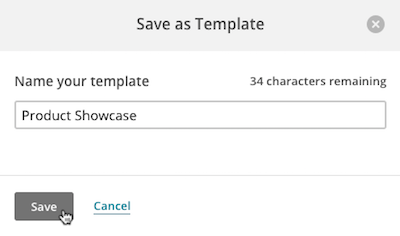 When you want to send a new campaign that looks similar to one you've recently created, you’ll choose a draft or recently sent campaign from the selection of templates in the Campaign Builder. To reuse a recently created campaign layout, follow these steps. In the Content section of the Campaign Builder, click Design Email. On the Template step, click the Campaigns tab. Choose Recently Sent from the drop-down menu to use a campaign you recently sent, or choose Drafts to use a campaign that hasn't been sent. Both options display up to 25 templates. Draft only displays templates for campaigns with content. Click the template you want to reuse. Your chosen layout will open in the Design step. If you think you’ll use a layout over and over again, you can save an existing email campaign layout as a template to speed up your campaign creation process in the future. To save a campaign layout as a template, follow these steps. Click the draft campaign you want to work with. To create a template from a sent campaign, replicate it and continue. Click Save as Template in the upper-right corner. Input a name in the Name Your Template field. Click Return To Campaign to continue working. After you save your template, you can get started with it from the Campaign Builder or the Templates page in your account. To choose a saved template from the Campaign Builder, follow these steps. On the Templates step, click Saved templates. Click the saved template you want to use for your campaign. To choose a saved template from the Templates page, follow these steps. 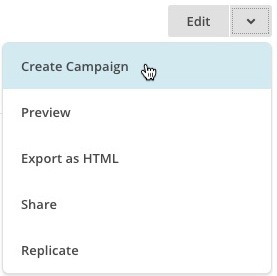 Click the drop-down menu for the template you want to use, and choose Create Campaign. This will take you to the Campaign Builder with your chosen template saved in the Content section. Click Edit Design to make any necessary changes.